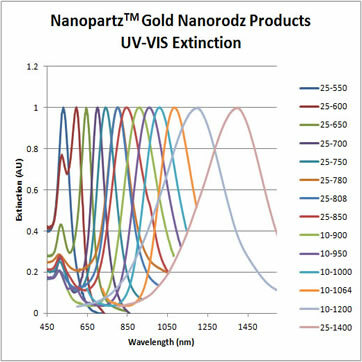 Nanopartz Gold Nanoparticles, conjugated specifically for in vitro applications, utilize the complete line of Accurate Spherical Gold Nanoparticles, Gold Nanorods, Microgold, Gold Nanowires, and Plasmonic Fluorophores conjugated via a proprietary covalent polymer bridge to the most popular in vitro terminations including PEG, alkyne, amine, azide, biotin, carboxyl, hydroxyl, methyl, maleimide, neutravidin, nhs, streptavidin, GSH, Protein A and G, Galactose, Thiol, and secondary antibodies. This family of products is well known for its resistant to temperature, salt, and pH, and for its exceptional loading capability. These conjugated particles can be used in a multitude of applications, including diagnostics, imaging, particularly in adverse environments. These particles are guaranteed not to aggregate. Every batch is completely characterized including size, monodispersity, aggregation, residual chemicals, and concentration. Typical volume is 1mL at a concentration of 50 OD. A Certificate of Analysis (COA) is provided for every order exhibiting TEM and UV-VIS images and data, as well as DLS data. In all cases, the loading of the target is determined. 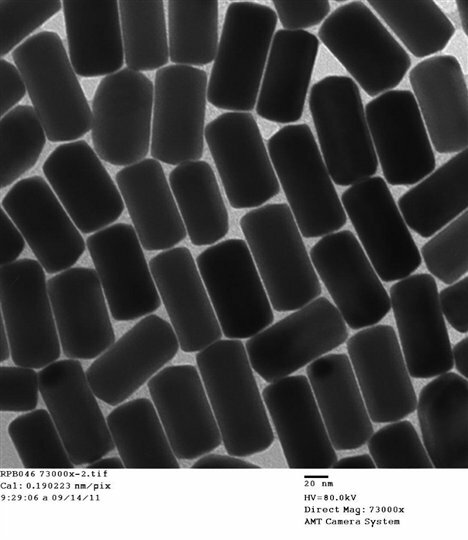 These nanoparticles are shipped in 18MEG DI water (default solution) with no measurable residual reactants. This product is available in 1mL volumes and larger. This product comes with a number of different covalent options. This product is known to be noncytotoxic. This product has been sterilized and is biological free. For post sterilization testing, please choose Sterilization Certification. For endotoxin purification, choose Endotoxin Purified. Simply divide the number of nanoparticles (nps) found on the included COA by the amount of solution you add. What is the shelf life if I never open the package and keep refrigerated? 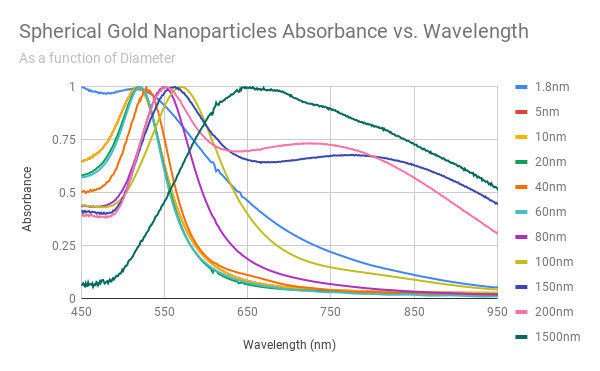 Why are your small gold nanoparticles colored? I have seen 2nm particles on other website that look as clear as water. All gold nanoparticles absorb and/or scatter. If you can't see them, then they probably aren't there. How does your polymer bridge compare to PEG? It is superior in its resistance to salt, pH, and other chemicals. 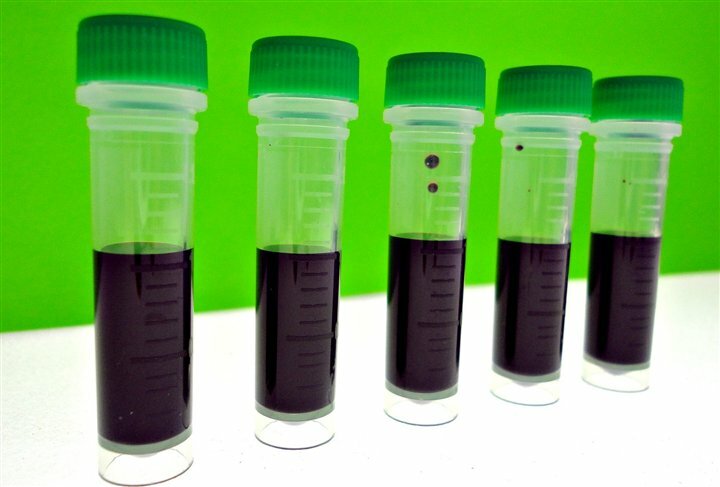 The manufacturing method for these nanoparticles are based on our proprietary method. This family of products have resulted in more than 100 publications and is the cornerstone of our product line. Other covalent polymer bridges are available as well. Please follow the menu to find options from 1 carbon to 30KDa length covalent polymer bridges. C11 - Product family number for In Vitro Spherical Gold Nanoparticles. 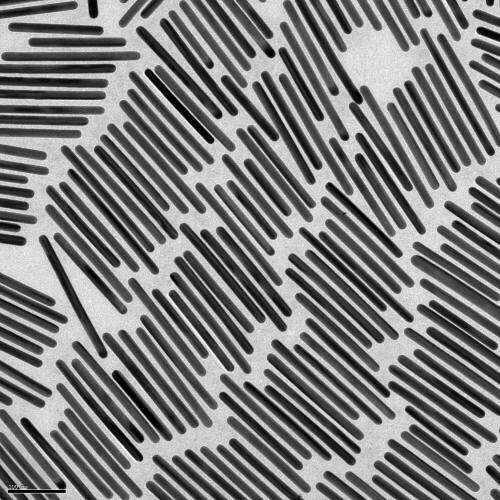 For Gold Nanorods, its C12 and so forth. TAZ - Covalent ligand, in this case Azide. 1 - Volume (mL). Other choices are 5mL, 10mL and more. Units 1 or 5 unit option. Example: For ordering 2.5mg, 5 units will come with 5 tubes of 0.5mg each.